Welcome to Dwel @ The Hepburn, a stunning union of sleek lines and warm textures. A beautiful painting by Martin J. Cervantez above the pincushion couch invokes sentiments of serenity and composure. An HDTV in the living room for some downtime. A long view of the fluid living space. Origami cranes greet you as you enter the apartment, setting the tone of the sea-inspired interior. A long island in the kitchen offers space for meal prep, storage and dining. The mix of white and dark, high and low cabinets and counters is ahead of the interior design curve. 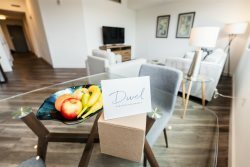 A Dwel residence is move-in ready. From the toaster to the coffee maker to the Mrs Meyers products to the pots and pans and more, this kitchen is fully-equipped. The sea vibes continue in the bedroom... The spa-like bathroom features a deep soaking tub, ample storage and a sleek European design. Upscale bath amenities from William Roam, soft vanity lighting and a handheld mirror complete the bathroom oasis. One of two bedroom closets with smart shelving solutions and gorgeous customized Dwel cotton robes. A full size washer and dryer complete this residence. Fully functional, luxurious and suited to you. The focal point of the living room is an original work of art entitled "Resonate" by local artist Martin Cervantez. It's about energy and you'll feel energized when everytime you return home to this unique 1 bedroom apartment. When it's time to rest, the sea inspired bedroom with our custom, handmade mattress and luxury linens will allow you to wake refreshed and ready to tackle the world. We love pets and are pet owners ourselves. In some cases, there are restrictions based on weight and in almost all cases there are restrictions for aggressive breeds. Let us know what type of pet you have and we can provide all the details. Pet fees include a $750 non-refundable deposit and $5 per night per pet rent charge.